What magnets are good to use on magnetic dry-erase boards? What size is strong enough to reach through the glass surface of a glass dry-erase board? What is a magnetic dry erase board? Dry erase boards, a.k.a. whiteboards, are constructed in a number of ways. The most common type has a thin, white, plastic coating on the surface of a board. Dry erase markers write well on it, though over time they can leave permanent marks on the surface. This inexpensive whiteboard is the type most widely available. It’s what you usually find in office supply stores. A magnetic whiteboard has the white surface deposited on top of a thin layer of steel sheet-metal, instead of particle board or MDF. Since it has steel behind the thin plastic, magnets stick quite well to it. 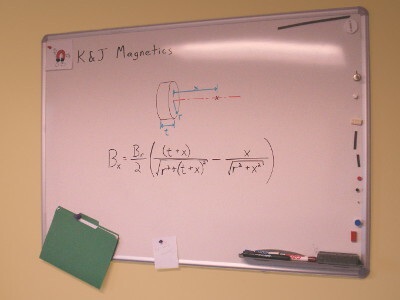 It’s easy to tell if your whiteboard is magnetic: not only do magnets stick to it, but the ones with a steel backer are much heavier. Some whiteboards are made of glass. For more durable, long term use, other types of whiteboards are available. Schools often use a board made of steel with a baked porcelain surface. The hard porcelain is so non-porous, it doesn’t absorb any of the marker’s ink. These can be used for many years without staining in a high-use setting. Glass is also becoming increasingly popular as a dry-erase surface. These high-end boards have a layer of glass that you write on directly. The smooth glass doesn’t absorb any ink so cleaning it is easy. Their non-stain nature is one of the selling points for these more expensive whiteboards. 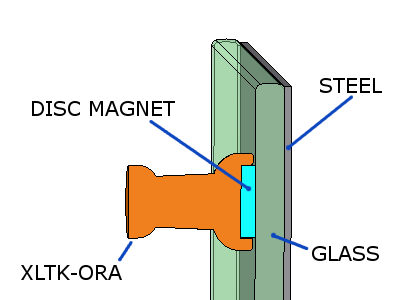 To make a glass board magnetic, a layer of steel sheet-metal is placed behind the glass. This works, but it isn’t quite as great as regular magnetic whiteboards. Magnetic performance suffers since the steel is so far behind the surface of the glass. If magnetic performance is your main goal, don’t pick a glass dry-erase board. Most of the glass boards we’ve seen use a layer of glass that is about ¼” thick (5-6mm). A magnet at the surface has to reach across that distance to attract to the steel underneath. A modestly sized magnet that sticks well to a refrigerator or regular whiteboard won’t be strong enough to hold well to a glass whiteboard. We certainly have bigger, stronger magnets that can hold. Unfortunately, picking the right magnet isn’t so simple. If you just choose really big magnets, they might attract to each other much more than the steel underneath. This can make an unpredictable, slamming-together mess. What magnets work well with regular whiteboards? Regular magnetic whiteboards can use just about any of the magnets mentioned in our Refrigerator Magnets section. Our Magnetic Thumbtacks are a great solution. They’re strong, yet easy to grab and handle. The smaller size holds up a few pages, while the bigger ones can hold a dozen pages! The video below shows some magnets that stick well to regular whiteboards, but won't work with a glass dry-erase board. What magnets work well with GLASS dry-erase boards? For glass boards, the smaller, “TK” size (like TK-BLU) doesn’t work at all. They’re just not strong enough. We find that the larger “XLTK” sizes (like XLTK-RED) are strong enough, but just barely. They’ll hold up a page or two and stay in place. Many folks find that they want a little more strength than a single XLTK thumbtack can provide. To do this, get a DA2 disc magnet and stick it on the surface of one of the XLTK thumbtacks. On a glass dry-erase board, this still isn’t as strong as it would be to the steel surface of your fridge door, but it’s a good hold. Our 1/2" diameter plastic coated disc magnets are also good for glass dry-erase boards. See magnets like the D84PC-GRN in our Plastic & Rubber Coated Magnets section. Their low profile is a little harder to grab than the thumbtacks, but they hold well. Can you make a magnetic shelf that sticks to a whiteboard to hold markers and an eraser? Sure. The trick is to keep the shelf shallow, though to prevent the weight of it from prying the magnets away. The shelf should be as narrow as possible to reduce its leverage. Keep it as close to the wall as possible. 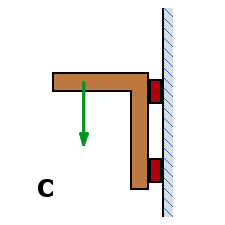 The shelf should include magnets that are vertically separated as shown in picture C, to give the magnets more leverage. Enough magnetic strength should be used to hold it to the wall, while also providing enough friction to avoid sliding.